With the release of the Farewell, the bonus episode of Life is Strange: Before the Storm, yesterday, the first iteration of the Life is strange saga has come to an end. But if you haven’t got stuck in to the adventures of Chloe, Max, and Rachel yet, you can enter our giveaway to pick up the limited Vinyl Edition of the game for free (please note: this is for UK address holders only). You like free games? Of course you do! Here are some of the best free PC games. The first Life is Strange game, set in the fictional Pacific Northwest town of Arcadia Bay, followed the adventures of Max Caulfield, who wakes suddenly from a dream to discover she’s gained the ability to rewind time. The five part adventure, released during 2015, saw Max reunited with childhood friend Chloe Price. As well as navigating the perils of teen angst, the game sees the pair investigate the disappearance of Rachel Amber. Life is Strange was followed up last year by Life is Strange: Before the Storm, a prequel developed by Deck Nine Games in which Max was entirely absent. Instead, the game focuses on the burgeoning friendship between Chloe and Rachel. With Max gone, the time-travel that was so important to the first game is absent too, replaced by the ever-ballsy Chloe’s ‘Backtalk’ minigame, which involves her talking smack to get out of some tricky situations. Before the Storm is a beautiful, heartfelt adventure, and the perfect prequel to Dontnod’s original. It’s at once instantly recognisable and a breath of fresh air for the series. You can check out our Life is Strange: Before the Storm review here. 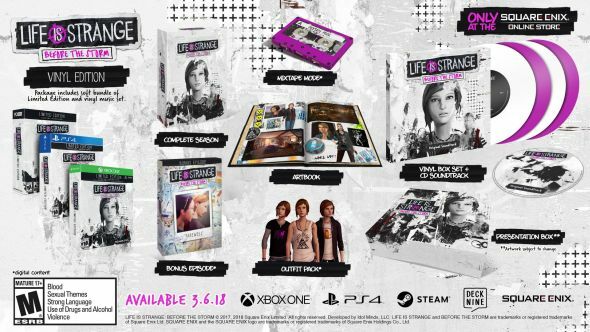 Now that Farewell, which acts as something of a prequel to the prequel, taking place just ahead of Max’s original departure from Arcadia Bay, is out, Square Enix have released two Deluxe Editions of the game. We have a version of the Vinyl Edition to give away, which includes everything you need to enjoy the series, whether you’re a newcomer or a veteran. As well as a physical edition of Life is Strange: Before the Storm, giving you access to all three episodes, the Vinyl Edition gives you access to the bonus episode, and if that weren’t enough, there’s also access to the first episode of the original Life is Strange. But that’s not all. There’s also an artbook documenting concept and development art from Before the Storm, and Chloe and Rachel figurines. Unsurprisingly, the Vinyl Edition contains the game’s soundtrack (performed by folk band Daughter) across four vinyl discs, but in case you don’t have a record player, it all comes on CD too. We’ve got one copy of the Vinyl Edition to give away, which is no longer available to buy via Square Enix. What’s more, those Chloe and Rachel figurines were only available as pre-order bonuses, with no other (official) way to get hold of them. 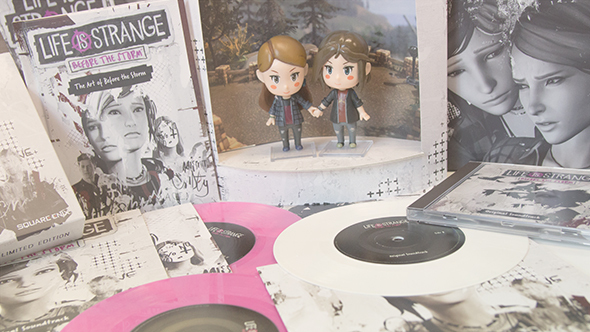 If you want to win the copy of the Life is Strange: Before the Storm Vinyl Edition then you need to enter the competition via the widget below – UK address holders only. Every action you complete is worth one entry into the giveaway, and the more actions you complete the more chance you’ll have of winning. We’ll also need your email address so we can send you a code upon winning – we won’t send you spam, we promise. Please read our terms and conditions before you enter.